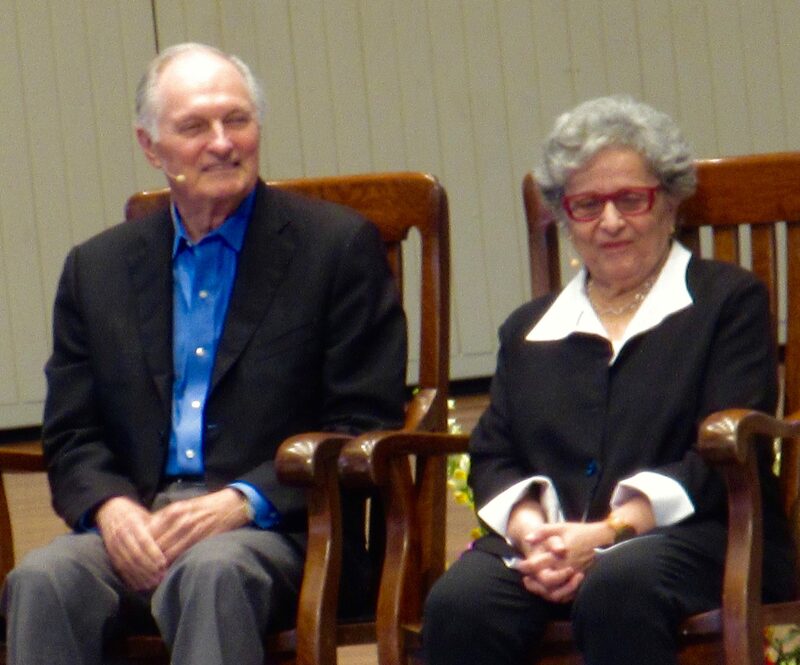 “Where will your imagination take you,” Arlene Alda asked, as she and her “Hawkeye” husband of sixty years shared the stage @ Chautauqua’s Creative Expression week with Roger Rosenblatt, a close friend. I was grateful to be front and center, writing away, grabbing the trio’s spirited nuggets and wellspring of stories. Now eighty, Alan began with a discussion of his book, Never get Your Dog Stuffed and Other Things I’ve Learned. He philosophized, “We are all going to die. We need a lot of laughs before we die…” At age eight, Alan’s beloved dog died suddenly. Sobbing, Alan and his dad carried the beloved pet across a field, intending to bury him. But as Alan was digging, he could not stop sobbing. In reaction, his dad suggested it might be better to stuff the dog so that Alan could always keep him. Stuffing seemed better than burying. The decision was made. Weeks later, recovered from the loss, Alan was faced with a dog fresh back from the taxidermist. Sitting on blue velvet in the living room, the once lively pet had a horrifying expression in his glass eyes. Alan’s memory was irrevocably altered. “You can’t hang onto something that goes. We can’t hold onto the people who die. We have to let successes go. We have to let failures go and move on. If you hang onto it, it becomes a stuffed dog. It only becomes a pale charade of what it was when it was alive,” he reflected. Arlene elaborated on how being in the present, following the imaginative trigger of her images, is a gift. A classical clarinetist, she evolved as a writer through photography. As a musician, she interpreted the composer’s art. In contrast, writing required a leap of imagination and courage. She likened it to Doctorow’s metaphor of how a car’s headlights in a fog illuminates slowly, bit by bit. I was totally identified with and grateful to resonate with the creative and spontaneous aspects of the Alder’s lives. Mindful curiosity in action, I thought. “If there weren’t originality, everything would be the same,” Arlene pondered. “The voice one finds in writing is a distinct voice, and the voices that one finds in writing are distinct so in that sense there is that core of originality and the possibility of the original. “The themes remain the same. It’s how we interpret them,” Alan elaborated. Amen! This entry was posted in Creativity, Happiness, Mindfulness, Relationship(s), Well-Being, Writing and tagged Imaginative trigger, Just Kids from the Bronx, Never Have Your Dog Stuffed, Originality, Writing on August 1, 2016 by fayewriter. Kat, Thanks for highlighting the “mindful curiosity in action” phrase…the Aldas’ keen awareness inspired me. Grateful for your friendship! Carol, I so appreciate your ethusiastic comment. Your perceptiveness and engagement with those fortunate to be your friend epitomizes the aliveness you bring to others. I am grateful for your thoughtful response and friendship. Nice to see and hear this couple share some of their wisdom. I don’t agree with their sentiment about letting go of lost connections. Memories of good times,reminiscence can nourish the soul. Hy, I didn’t have the sense that either Alan or Arlene Alda were saying to forget but rather not to hold on ( as in stuffing a dog) but to deal with it and engage in the present— i.e., his curious passion for science which is woven through his memoir.Arlene’s book about the Bronx began with her own cherished memory and she went on to collect the cherished memories of others. Memory enriches our lives. Marcel Proust recreates long past experiences, i.e. of eating a Madeline and drinking tea with his grandma who he loved and lost while sipping tea and smelling a Madeline years later. All his work is flush with memory. We’re lucky if we can recall the past as we live richly in the present. We try to hold on to the past with photos, memoirs etc. Memory shapes our lives. Sheila, I quite agree. Memory enriches our lives! Thank you for sharing Alda’s story about the stuffed dog. It is a great illustration that we must live in the moment . Thank you, Heather. Your blog certainly is testimony to how you weave the past into the present and offer words to live be. Faye, Reading one of your posts is always good way to start the day. Thanks for this on. Thanks, Kathi. Glad you enjoyed the blog. The Alders were a wonderful subject for me. Last year Arlene Alda spoke in the Bronx Museum about the people whom she had interviewed for her then upcoming book “Just Kids From The Bronx!” I spoke with Arlene after her interview on stage, and told her how much I appreciated remembering so many of the experiences that she talked about in her life and in her book, especially all the exciting childhood activities, that we were all involved in, that took place right in our courtyard and our neighborhood park! We actually grew up not too far from each other. Her husband sat next me in the front row smiling with adoration! I like how numbers–e.g., sixty, sixteen, four–matter in this piece. I especially like the juxtaposition of “eighty” and “eight” in the same paragraph, implying the easy leaps memory makes, back and forth in time. Rosemary, I so enjoy your attention to the writerly details of my piece. You are like a detective following the clues that I had not noticed. Thank you for this fun comment.